For years the best-selling vehicle in the U.S. has been the 15-mpg average F150 pickup. With gas prices climbing like a frigid scrotum, maybe today's Nice Price or Crack Pipe VW diesel pickup would be better than best? Like nationalized healthcare and coins with holes in them, higher gas prices are something Europeans have been used to for years but that makes people in the U.S. apoplectic. The increased costs have driven talk of opening up the federal oil reserves, and of going to other countries to secretly siphon the gas out of their cars using a hose and gas can, with a breath mint for after. Most of those ideas only address supply, which isn't the problem, as you can still get all the gas you want, it's just that the combination of Wall Street speculators and the fact that it we Americans don't seem to be terribly fiscally responsible have sent the prices through the roof. Four dollars a gallon for regular may seem steep, but it's likely that by summer, we'll see even another buck a gallon added to that. Perhaps then the onerous cost will overcome the inertia of the American public, who seem willing to pay pretty much any amount for anything, just as long as it's not taxes. Maybe at that point they'll do something abjectly un-American, and will address their consumption. Today's custom 1981 VW Rabbit Caddy turbo diesel might possibly give one lucky buyer a jump on the rest of us towards that end. The Caddy came out of Westmoreland, and, along with the Chrysler Rampage/Scamp twins, helped define the mini-El Camino market in the ‘80s. The Mo-pair have their followers today, but no where near the number that the VW pickup has engendered. The ability to drop any of the plethora of Volkswagen mills - from gas-burning narrow angle sixes, to frugal and rattly diesels - makes the MK1-based Caddy, like all its Rabbit and Golf brethren, objects of affection for the wrench-turner crowd. This Jetta-nosed and GTI-fender flared custom has seen some serious affection by its owner, who claims to own a German VW shop. His ad description of the truck is light in both detail and proper punctuation, but the gist of the changes he hath wrought are the upgrade to a 1.6-litre diesel four, pressurized by an 18-22-lb turbo. Backing that up is a rebuilt 020 5-speed, and he says that combo is good for mid-40s mileage. Along with rebuilt or upgraded fuel pump and injectors, he's also installed a power steering conversion in the truck, so that even seven year-old girls can parallel park it. Outside, the truck benefits from the aforementioned body mods, and an in your face red paint job. Silver 8-spoke alloys look appropriately sized for the truck, and in fact the only questionable visual element is the German on the glass, although at least Deutschland and Guten Tag are friendly and not John Galiano-esque screeds. There are no pics of the inside, but the seller does say that it comes with a ‘theatre stereo system, and that the seats and dash are in good shape. Based on the exterior, we might want to give him the benefit of the doubt that it doesn't look like the world's most hillbilly Faberge egg in there, although pics would have been nice. The mileage, at 150,000, could also be given a pass as much of the truck appears to be nearly new, and the seller says that it's been spending a lot of time sitting on the bench. 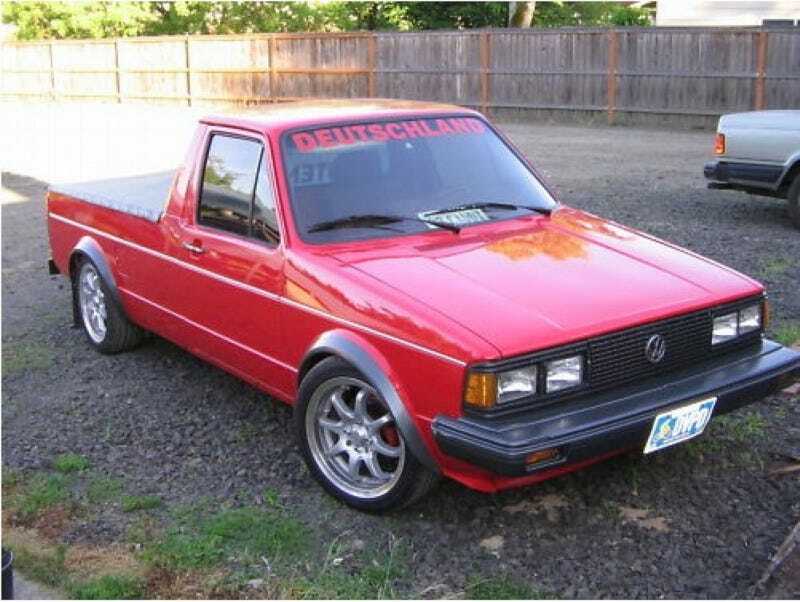 Overall, if someone is looking for a either a really nice Caddy, or a way to beat the seemingly unstoppable ascent of gas prices, this VW truck may be just the ticket. Sure Diesel is more than regular right now, but the damn thing will likely get more than 40 on the highway, extending time between those painful fill-ups. But in order to thumb your nose at those Wall Street speculators, and impact oil company profits to the extent that their CEOs demand government action against you, it will cost $14,000. That's over 3,500 gallons of regular. What do you think, is that a reasonable price to pay for both a sweet VW pickup, and a way to future proof your fuel costs? Or, is that a preis that makes you say nicht guten tag! ?